Tuesdays are my least favorite day of the week, and the one where my enthusiasm for anything kitchen related seems just about nill. The Monday energy and excitement for a new week has generally dissipated and the hours until the weekend are far too great. This is especially true this time of year, as the days are getting shorter and colder. That said, it helps to have something warm and reliably tasty to come home to after a long day at work. 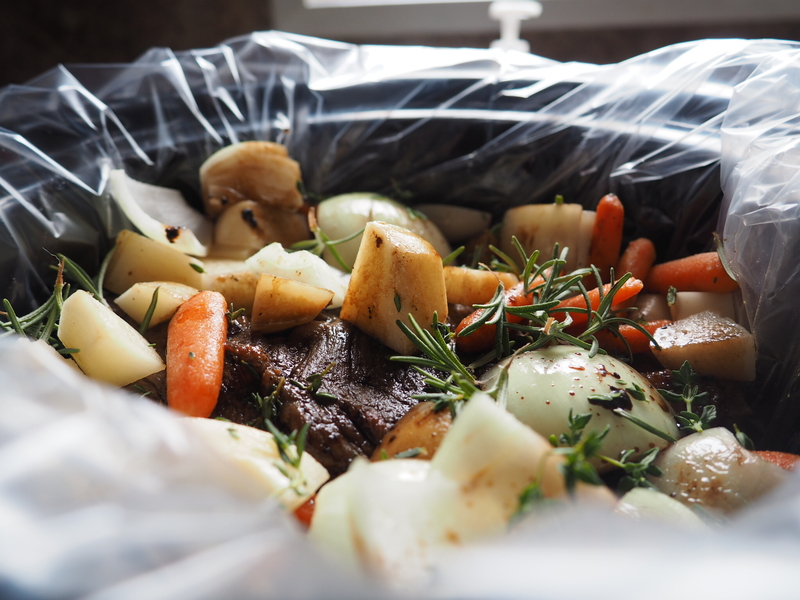 Enter, the perfect slow cooker pot roast. I will usually prepare this a day ahead of time so all I have to do in the morning is take it out of the fridge and turn it on. So easy! First things first – add a liner to your crock pot. These things are super affordable and a complete lifesaver when it comes to clean up. Generously season a nicely marbled cut of meat with salt and pepper and let sit for five minutes while you prep your pan. Heat a large pot or Dutch oven over medium-high heat and add 2 tablespoons of cooking oil. Next, prep the veggies. Cut the onion in half, peeling off the outer layer of skin. Then chop the carrots into 2-inch slices and quarter the potatoes. When the oil in the pot is starting to sizzle, add in the halved onions, browning them on both size, before removing them to a plate. Then add the carrots and potatoes into the same hot pan and toss until slightly browned (about a minute or so). Add half your veggies to the crock pot and put the other half aside to layer on top of the roast. Next, add a dab more oil if needed before placing the meat in the pan and searing it for about a minute on all sides until it is nice and brown. Remove to the crock pot and layer the rest of the veggies on top. With the burner still on med-high, use either red wine or beef broth (about 1 cup) to deglaze the pan, scraping the bottom with a whisk to get off all the meaty bits before pouring on top of the meat and vegetables. Add in the fresh rosemary and thyme, as well as the bay leaves. Cover and cook on low for 7 – 8 hours and it will be ready and waiting by the time you get home from work. Enjoy! < Previous Halloween Birthday Pug!